The newly-promoted Seagulls are without a win in six matches and have slipped to 13th place, three points above the Premier League relegation zone. They have picked up just two points from a possible 18 and not scored a goal from open play in their last five outings. But Hughton said: "Is it a crisis? No. It's not because we are a newly-promoted team so in some aspects when we went through a good period, it was better than people expected. "We have to take that into consideration. We are amongst a group of teams who are also not in good form. "We are the newer ones in the division and we are gaining experience as we go along. "But that doesn't mean it's something we are particularly happy with. We are conscious we need to start picking up points and scoring goals." Brighton might not have been expected to get much from a visit from Liverpool, a trip to Manchester United and Wednesday night's 2-0 defeat at Tottenham. But next up is a visit from another top-six club, albeit in the shape of Sean Dyche's surprise packages Burnley. 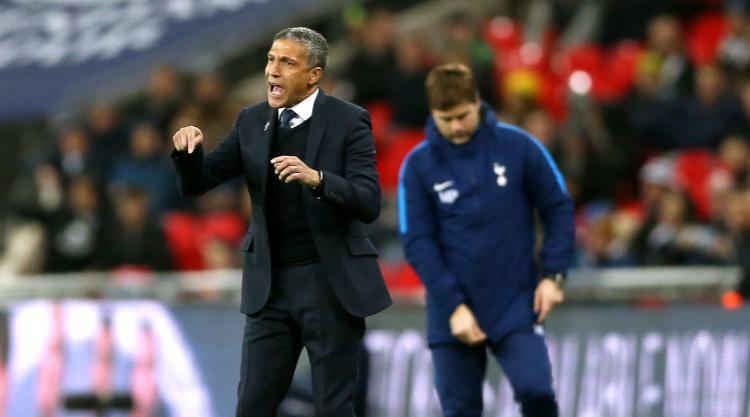 "We need a win as badly as we need any win," added Hughton. "By our standards we are going through a difficult period, but that was always going to happen. It could have happened earlier in the season or later. "What it means is it puts more pressure on the next game, and then the next one after that, but those are the challenges and teams who rise to those challenges the most will get out of the situation and into a far more comfortable position. "As for Burnley, in the same way we speak about Manchester City, for different reasons they have been exceptional. "You only have to look at the group of players - they don't change the team often - their rise over the last couple of seasons and some of the results they pick up. "For a club with the finances and infrastructure they have, to be riding so high and looking so consistent speaks very highly for everyone concerned there. "Sean has developed so well over the last few seasons. It was credit to Burnley that when they went down they allowed him the opportunity to rebuild again and have since gone from strength to strength. "In an era when we want to see as many British managers in the game it's great to see one doing as well as Sean is."